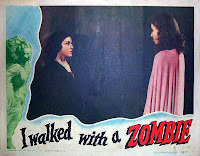 Horror movies aren't generally my kind of film, but I've been curious about the floridly titled I WALKED WITH A ZOMBIE for some time now, inasmuch as it's an adaptation of JANE EYRE and stars two favorites, Frances Dee and Tom Conway. When a friend of this blog mentioned to me in an email that the film was airing on Turner Classic Movies the other evening, I recorded it on my DVR. I found the movie very worthwhile, with excellent performances, great mood, and stylish direction by Jacques Tourneur. 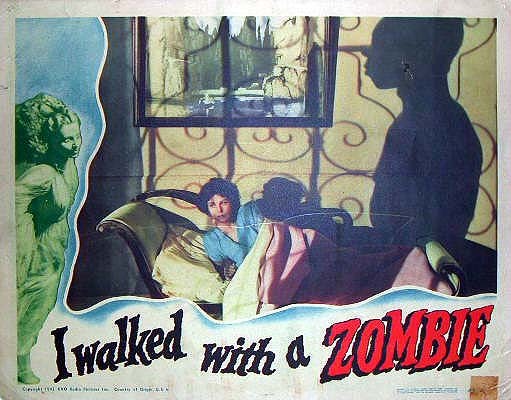 I WALKED WITH A ZOMBIE was the middle of three films Tourneur made with RKO producer Val Lewton, who was known for turning out atmospheric thrillers on a minimal budget. 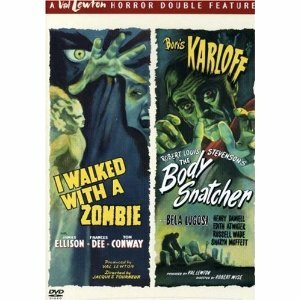 Their first film together was CAT PEOPLE (1942), and ZOMBIE would be followed by THE LEOPARD MAN (1943). I WALKED WITH A ZOMBIE is the story of Betsy Connell (Dee), a Canadian nurse who travels to the West Indies sugar plantation of wealthy Paul Holland (Conway) in order to care for his catatonic wife, Jessica (Christine Gordon). Betsy quickly falls for Paul, but being a noble sort, she wants to do the right thing and find a way to restore Paul's wife to a normal state. Medicine holds no answers, and at the urging of a maid (Teresa Harris), Betsy even takes Jessica to a voodoo ceremony. Betsy's voiceover thankfully explains and dismisses the title immediately, and the film itself is really quite beautiful, in its chilling way. The set design, the constantly beating drums, and the native music all combine to create a unique atmosphere. A calypso singer (Sir Lancelot) who is determined to give Betsy some of Paul's family history via his song lyrics is particularly effective. The film also manages to scare the audience half to death, most notably during a late-night walk through the cane fields, without a drop of blood or single bit of gore. Dee is particularly outstanding, by turns sympathetic, loving, curious, and nervy. At times she made me think of Nancy Drew as she bravely explored the island by night with her flashlight. Dee's Betsy is a bright girl eager for new experiences; the latter seems to overcome the former when it comes to checking out the local voodoo scene, which at least makes her gullibility in that regard somewhat believable, along with her desperate desire to cure her patient. Betsy also does a fine job managing Paul's alcoholic brother Wesley (James Ellison) and their kind but odd mother (Edith Barrett). 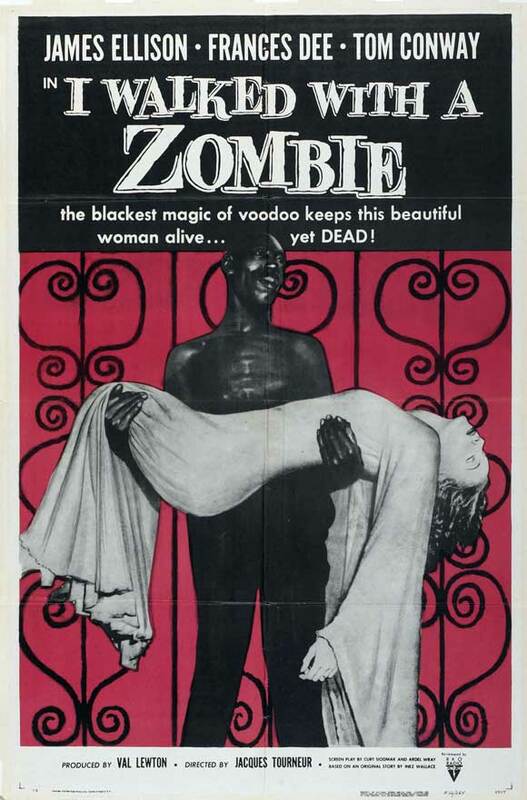 I did a little skipping forward with my remote during the voodoo moments, as those scenes weren't something I enjoyed or was comfortable with, but they were very brief; indeed, the film itself is a fast-paced 69 minutes so it doesn't dwell on anything for very long. At times I would have liked a bit more back story or explanation, and yet at the same time, the fact that not every aspect of the characters' histories is spelled out added to the film's mysterious feel. The film's lead performances, overall style, and classic story underpinnings, with the tormented owner of the estate and the mad wife wailing in the tower, made it very much worth checking out. The ending is both disturbing and poetic. Jacques Tourneur would later direct Frances Dee's husband, Joel McCrea, in the classic Americana STARS IN MY CROWN (1950), as well as in the Westerns STRANGER ON HORSEBACK (1955) and WICHITA (1955). The supporting cast includes James Bell, Jeni LeGon, and Vivian Dandridge. 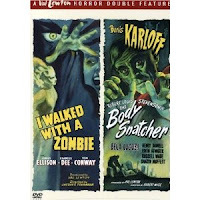 I WALKED WITH A ZOMBIE is available on DVD as part of a Val Lewton Double Feature, teamed with THE BODY SNATCHER (1945). It can also be purchased as part of the Val Lewton Horror Collection. The DVD can be rented from Netflix. Extras include a commentary track. The trailer is available at the Turner Classic Movies site. I hope anyone who hasn't seen it follows your recommendation of "I Walked With a Zombie". The Val Lewton Collection is (well, next to my Charlie Chans) the jewel of my movie collection. If you haven't seen them, may I heartily recommend "The Ghost Ship" and "The Curse of the Cat People", if for nothing else, the presence of Sir Lancelot? "The Curse of the Cat People" is a very moving exploration of childhood loneliness hiding behind its lurid title. What was so uncomfortable about the voodoo moments? It was pretty inocuous stuff, in fact not even scary. That's an important plot point. It wasn't the voodoo ceremony itself - it was how the characters believed it affected them. Did the voodoo work or did the people act like that because of their own weakness? Logic vs emotion and fear. I simply found the voodoo moments ugly and disturbing, especially since the behavior depicted is so strongly at odds with my religious faith; I was more comfortable limiting my exposure to just what was necessary to understand the characters. ALL of the Lewton/RKO "horror" films are well worth seeing (again and again!). Gee, the voodoo ceremony didn't bother my religious sensibilities at all. Laura have you ever seen a real voodoo ceremony? You would completely freak out. A really interesting plot point is that the European woman who fell under voodoo's sway - who truly believed that she successfully cursed Jessica - was the missionary / medical woman. No other white person really believed in voodoo. They wondered a lot. Even Betsy considered voodoo as "alternative medicine". It's a really fascinating plot point and an excellent vignette of human nature. A similar theme is covered in "Isle of the Dead". Reason and Faith vs, superstition and fear. Lewton films have such great ideas. Also, I really agree with Caftan Woman's suggestions. It's hard to choose a favorite Lewton film, but Curse of the Cat People is definitely in my top three. It's not a horror story at all, but a very touching story of a little girl with too much imagination. Thanks so much for recommending the film, Jane! I agree, the cinematography was absolutely exquisite. When I think of the movie the first thing I think of is simply the way it "looked" -- including the constant breezes and rustling wind. Loved that aspect. Thanks for adding your recommendations, Brad! We enjoy many of the same films so that's all the more reason to try additional Lewton films. Nope, I haven't seen a real ceremony, Panavia, and you're probably correct about how I would react (grin). I didn't even care for that aspect of the otherwise enjoyable animated THE PRINCESS AND THE FROG (2009). What we individually bring to and take away from films, and being able to discuss it, is part of the fun! I think what you mention, the mother being the one to believe in voodoo, was definitely interesting. It was part of the film's sort of "elliptical" storytelling, omitting a lot of back story and motivations, which ironically makes the film more mysterious and thought provoking. This ties in with another point you mention, about Lewton and the film having "great ideas" -- that's one reason I found the film so worthwhile despite my reservations. The movie gives the viewer a great deal to consider, long after "The End" comes onto the screen.